Canceled N. Korea summit may leave Hawaii vulnerable to attack. President Donald Trump’s decision Thursday to cancel his summit with North Korea’s Kim Jong Un was more than just a blow to peace in the Korean Peninsula. Star-Advertiser. Civil Beat Poll: Tulsi Gabbard Is Hawaii’s Most Popular Politician. Only former President Obama gets higher marks than the Hawaii congresswoman. Civil Beat. Civil Beat Poll: Hawaii Voters Seem Ready For A Constitutional Convention. A solid majority of those surveyed support the idea of holding the first such event in 40 years. Civil Beat. April is a traditionally off-peak travel month, however, Hawaii hotels statewide reported solid increases in revenue per available room, average daily rate and room occupancy, according to the Hawaii Hotel Performance Report issued by the Hawaii Tourism Authority. Maui Now. After seven years of growing Hawaii auto sales, the state could see a decline this year. New-vehicle registrations in the state fell 4.3 percent in the first quarter and are projected to drop in 2018. Star-Advertiser. U.S. Sen. Brian Schatz is co-sponsoring a bill to suspend newly imposed tariffs on Canadian newsprint that is driving up business costs for domestic newspapers, book publishers and commercial printers. Star-Advertiser. Beachgoers are being advised of elevated bacteria levels at three beaches across the state. Hawaii News Now. A federal grand jury returned a new indictment today against retired Honolulu Police Chief Louis Kealoha and his deputy prosecutor wife Katherine Kealoha. Star-Advertiser. A second superseding indictment against Honolulu's ex-police chief and his deputy prosecutor wife offers new details on the bank fraud, aggravated identity theft and obstruction charges against them. Hawaii News Now. Honolulu Cop Fired For Domestic Violence Gets His Job Back. But a labor board panel has temporarily blocked Honolulu Police Chief Susan Ballard’s effort to release information explaining the decision. Civil Beat. Police union blocks release of details about officer's contentious reinstatement. Hawaii News Now. Bill 30: Buy Rail "Remnant" Properties. The Honolulu Rail Transit Project is scheduled to start construction on the final city center segment through downtown Honolulu next year. Hawaii Public Radio. Fate Of Popular Swimming Cove In Kahala Remains Uncertain. A rocky breakwater creates a unique attraction known as Cromwell’s, but it’s been a liability for owners of an oceanfront museum. Civil Beat. Two Honolulu-based commercial fishing companies have been ordered to pay civil fines after they discharged oily bilge waste into the Pacific Ocean. Star-Advertiser. Elevated walkways connecting condominium towers in Kakaako were a state vision decades ago. Now the developer of the biggest master-planned community in the area wants to put some in place. Star-Advertiser. Lava From Kilauea Enters Ocean From Three Flows. The U.S. Marine Corps sends two CH-53E Super Stallion helicopters to help if more evacuations become necessary. Associated Press. A third lava flow was entering the ocean in Lower Puna, the latest hitting the water between Pohoiki Bay and Mac­Kenzie State Park, Hawaii County Civil Defense officials said Thursday. Star-Advertiser. Blue flames from methane vents surprise scientists. Associated Press. No sign of increase or decrease in amount of lava; ash plumes persist. 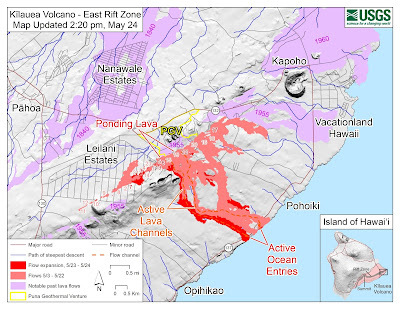 Three weeks into the lower Puna eruption, volcanic activity remains high but stable along Kilauea’s East Rift Zone. Tribune-Herald. Spectacular, but destructive, lava fountains were active in the northeast section of Leilani Estates on Wednesday. The fissures were producing huge ponds of lava and feeding flows that were covering roads in the Puna subdivision. Big Island Video News. Kilauea volcano’s ongoing eruption is destroying or damaging farms through the air, on the ground and from beneath the Earth’s surface. Civil Beat. 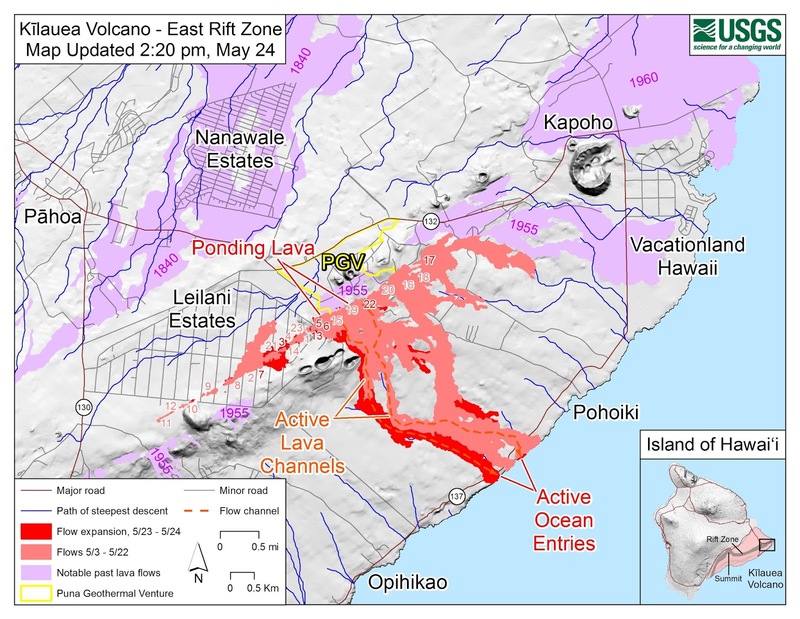 At least six separate fissures are erupting in lower Puna, pumping out an incredible 40 to 60 cubic feet of lava per second, spewing fountains of lava into the air and creating flows that are cascading into the sea some three miles downslope. Hawaii News Now. NASA uses powerful instruments to help monitor eruption. Tribune-Herald. Lava, Loss of PGV Capacity Create Electricity Challenges. Hawaii Public Radio. Puna family still in shock; others hold on, hoping they’ll be spared. Eruptions from Kilauea Volcano have displaced thousands of Puna residents, devoured at least 50 structures and threatened dozens of others in its path. Star-Advertiser. Another Eruption at Kilauea's Summit Sends Ash 10,000 Feet High. Hawaii Public Radio. With one highway severed and another one threatened, officials continue to be frank about the possibility of lava flows isolating residents in lower Puna. Tribune-Herald. With regular explosive bursts at Kilauea’s summit, ash continues to drift over Pahala, covering everything in a fine layer of charcoal-colored dust. Tribune-Herald. Hawaii mayor Harry Kim giving back to the community since 1977. KITV. The state Department of Transportation on Thursday began its scheduled inspection of Wailuku Bridge, known as the Singing Bridge, in Hilo. Tribune-Herald. The Senate Appropriations Committee passed a bill that includes $3 million to protect Hawaii coffee and maintain agriculture research facilities in Hilo, as well as $32 million to support agricultural inspection stations in airports. Pacific Business News. With a ceremonial passing of the colors, outgoing Lt. Col. Christopher M. Marquez relinquished command of Pohakuloa Training Area to Lt. Col. Loreto V. Borce Jr. West Hawaii Today. Mass Transit's cash handling process was inadequate and ineffective to ensure that revenue is properly controlled and deposits are timely and accurate, the auditor found. Big Island Video News. Kapalua is Dr. Beach’s No. 1 pick. A crescent-shaped beach on Maui got the top slot Thursday on the list of best beaches issued annually by a Florida professor known as Dr. Beach. Associated Press. Maui County hotels defy usual April doldrums. Higher average daily room rates and revenue reported. Maui News. Telescope protester’s trial put on hold. Motion filed in Hawaiian seeking dismissal for lack of a speedy trial. Maui News. As parts of Kauai continue to rebuild from last month’s record rain and flooding, county officials estimate they will need an initial $31.2 million for 90 road, bridge and park repair projects. Star-Advertiser. Residents of Wainiha and Haena gathered as a community Thursday to discuss what kind of future they envision for Kauai's north shore as the island continues to rebuild. Garden Island. More than a hundred people gathered in downtown Honolulu Thursday night to raise money for flood victims on Kauai. KHON2. Gov. David Ige spent Thursday morning learning about the impacts of April’s flooding on the North Shore. Garden Island. Hawaii has committed to boosting coastal fisheries, and a new study identifies east Kauai as one of the highest-potential fisheries for population recovery. Garden Island.